Before we go into various reasons why your boyfriend, your man, HE won’t propose, let me ask you something more general: Do you think it is “old fashioned” for the modern day woman to desire marriage and want to settle down with a man she loves? Well, no matter how millennial media talks down on marriage or glorifies live-in relationships as the way to go, my experience as a relationship coach who has helped over 107 of my clients “get the ring” says otherwise. For instance, currently, I am working with 5 different private clients, mostly from corporate America, and all women in long-term committed relationships, who are wondering why he won’t propose and want their partnership to go to the “next level”. Are these women backward or old-fashioned? I don’t think so. One is a CEO of a leading American social media company with 30 global employees, another a senior data analyst for a petroleum company, yet another a real estate manager in charge of investments from Sheikhs in Dubai. And yes, these strong and successful women of today want the ring, they want their man to get down on his knees, make a proposal and start a family – and no, I don’t think we should judge their desires as backward. I passionately believe that our desires are our desires and we need to honor and OWN them as women, not judge ourselves or our fellow sisters for having them. A valid question on a sincere woman’s mind, when she’s given many years of her love, body and devotion to her man, don’t you think so? So today I want to give you the top 3 reasons of why he won’t propose, and how you can start turning that dynamic around in the relationship, quickly! This one is the most painful to digest, but if you’ve read done my Attract Your Soulmate audio program, you know how I explain there in module 2 that a man’s commitment timeline is very different to a woman’s commitment timeline. For a man, “girlfriend” can be temporary, for now – but for us women, more often than not, if we’re going into a girlfriend-boyfriend exclusive relationship, it means forever. These different commitment timelines result in you and your man not being on the same page about where your relationship is going – thus, making it easy to understand why he won’t propose. 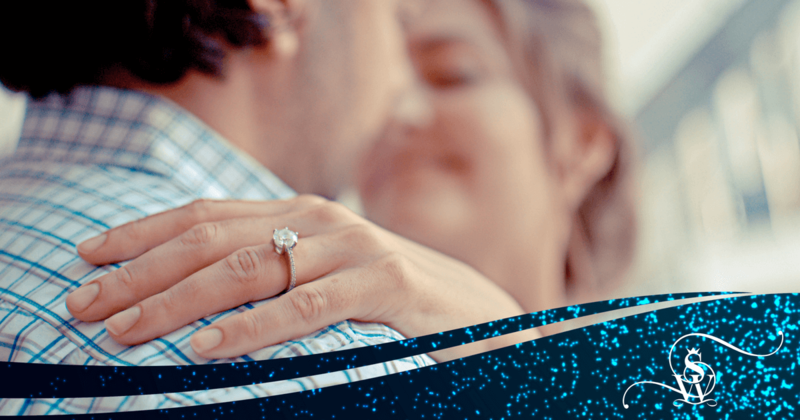 While you think the ring and proposal is the natural next step for your relationship, he may not have even considered the possibility of marriage or making you his wife. It is no wonder that there are so many unhappy girlfriends, hoping and expecting the ring to come, but their men aren’t even aware of this! The good news though is that, when you come to me even at this stage, we can still create a new, empowered, attractive dynamic in the relationship, that can help you get your desired results. We do this by tweaking your behaviours within your current relationship and surprising your man by creating completely new dynamics, where he starts to see you as the valuable and priceless, high-value, feminine woman that you are. I also work at this stage with helping you to get rid of your “nice girl behaviours” and own your power and edge in the relationship much more boldly. At the end of the day, I truly believe it isn’t about the men and why he won’t propose, but instead about you learning to stand in your full power and feminine glory that will get you the results that your heart desires. And this inner work is what I will help you with. Most of my clients who have adopted my approach have gotten amazing success with their men. You can read about the many success stories here. Men are human beings and, just like us, they have been burned and rejected in the past. Maybe he won’t propose because he had an ex-wife who cheated on him, even though he loved her dearly? Maybe he won’t propose because he still hasn’t worked through the pain and rejection of the last divorce or breakup? Maybe he won’t propose because he feels that marriage and children will trap him and limit his freedom? Whatever the reason may be that he won’t propose, these subconscious commitment fears can prevent a man from proposing to you, even though he loves you in a fundamental way. Well, you can’t. You have no control over his fears. He has to be willing to do the work needed on himself, whether that looks like owning up to this himself or going to see a therapist or counsellor. However, in my repeated experiences with my successful clients, what I have come to learn is that, when you start owning your full diva power in your relationship and start creating the new, attractive dynamics I talked about, your man will feel inspired from within to work on himself or overcome his fears. The truth is that, when a man cares about you, there is no fear too big to overcome. He just has to feel inspired enough to do it for you. How to create that kind of attraction within him? I teach exactly how to do this in my advanced program for women in relationships, Soulmates Forever, which you can instantly download and get started with now. 3. You are preventing him from connecting with you. Believe it or not, so many of my clients are surprised when we start coaching together and we figure out all the ways in which they have been pushing their wonderful man away, and in this way contributed to why he won’t propose to them. Did your love feel fresh as dew, and was he an attentive, loving, masculine man at the start of your relationship? And then with time, did things start to go down-hill and he got less attentive, while you got more anxious, controlling and insecure? Well, if this is the reason why he won’t propose, the good news is that this category of problems is super easy to fix and turn around. In my audio program Soulmates Forever, I have outlined the eight toxic behaviours that we women do, that push even the most wonderful men away. I still have to watch out on these behaviours myself, in my own wonderful marriage with Chris. But what I have noticed is that, once you become aware of these behaviours and stop doing them in your relationship, your relationship will instantly breathe a sigh of relief – and the results are almost instant. The fights and arguments will reduce and the romance will start to return, setting the stage for the fulfillment of your desires of that forever commitment. After this, in Soulmates Forever, I also teach you the four behaviours that you can then use to enhance and build more attraction within your man and bring him closer, like never before. Once the healthy dynamics have been restored within the relationship, in our private one-on-one sessions, we will empower you to speak from your heart with your man and honor your desires in the relationship. It is my life’s gift and utmost passion to help women relax into their worthiness, divine femininity and get the love and commitment they deserve. If you’d like my help with your relationship and in getting to the ring, send us an email at support@samiwunder.com with details of your situation, and my team will get back to you and help us connect.